On the way back to Bangkok from my holiday in Laos, I stopped by at Udon Thani province in North-eastern Thailand and bought their most famous food ‘naem nueng’ back home. 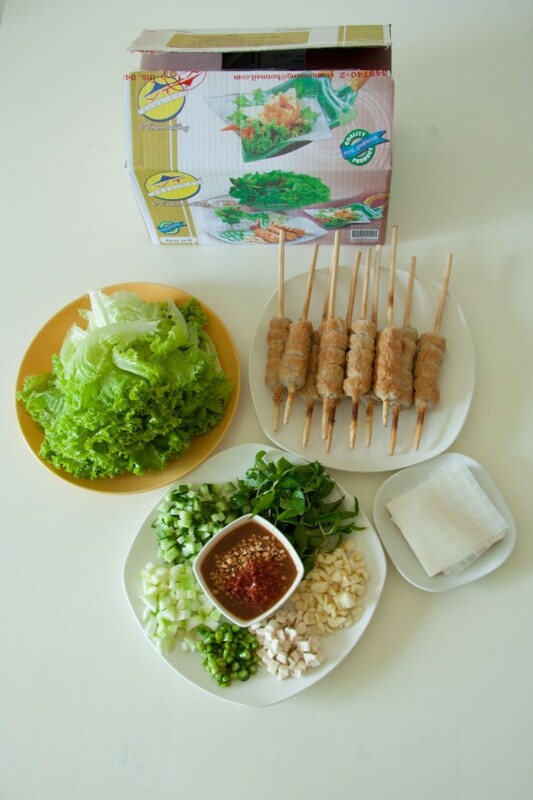 Naem Nueng (แหนมเนือง /năeme nueang/) is Vietnamese style meatballs that are wrapped in rice paper and served with a generous platter of fresh herbs and vegetables for wrap customization. The food is known as Nam Nuong in Vietnamese. 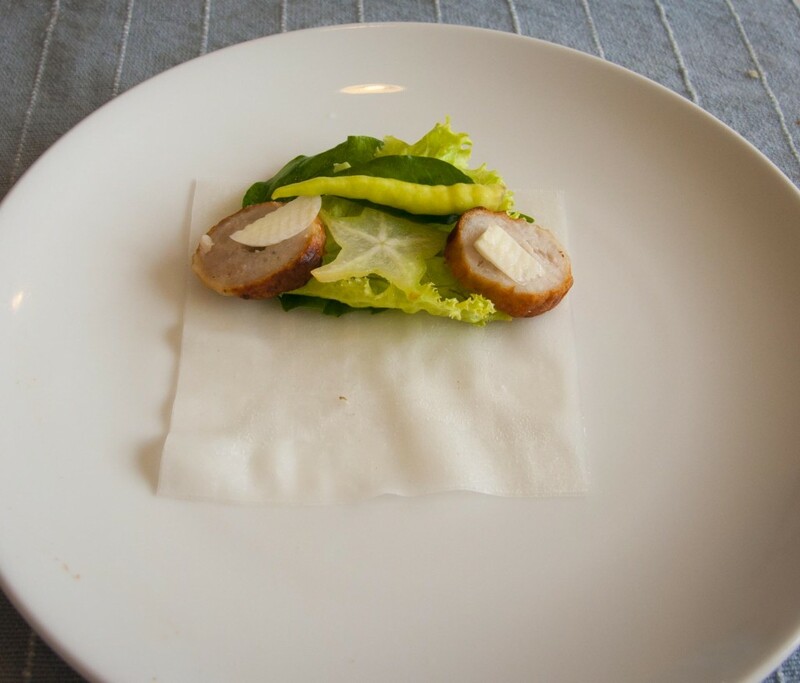 In the old time this dish was served only in the palace. It was brought to Thailand by Vietnamese immigrants while they were moving to Thailand’s Mekong River provinces since the French colonial years, so it became to be a famous food in North eastern (อีสาน Isan) region of Thailand, specifically Udon Thani until the recent decades. Word has it that a group of Vietnamese descendents, who originally settled in Nong Khai, made famous naem nueng in Thailand when they opened a restaurant selling this specialty in neighboring Udon Thani. 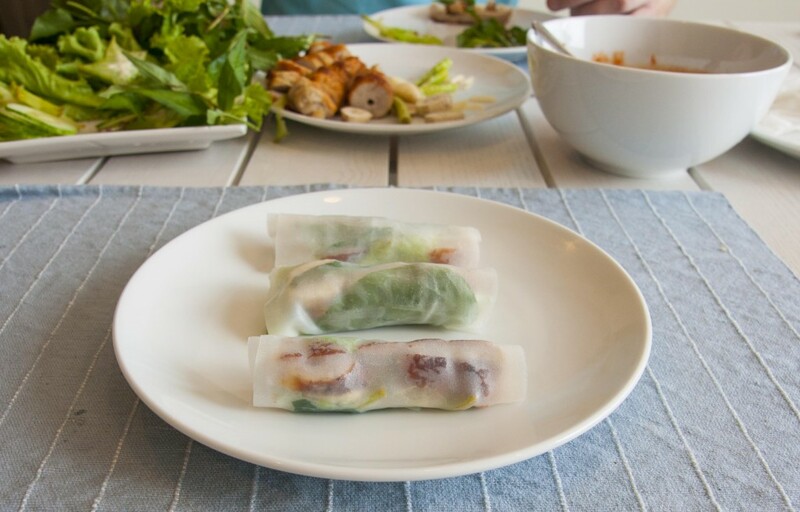 – Spring roll sheet : When it touches the water, it should be sticky, not torn apart easily. – the dipping sauce : it should be thick and made from minced liver and topped up with crushed peanut and ground chili. – side vegetable : raw banana, raw mangoes, cucumbers, fresh chillies, garlic, star apples, and lettuce. 1. Rinse the vegetable and cut all the ingredients into small pieces and assemble them on a plate nicely. 2. Mix the dipping sauce with the chilli and crushed peanuts. 3. Soak the rice paper in water just a few sendons and let it dry on a plate for about three minutes to soften them for eating. 4. Place the diced ingredients on a piece of softened rice paper, wrap the edges of the rice paper inward to create a small package. If you have a chance to visit Udon thani province , you can find Nam Nueng in downtown or at the airport. The most popular brand is called “VT”. 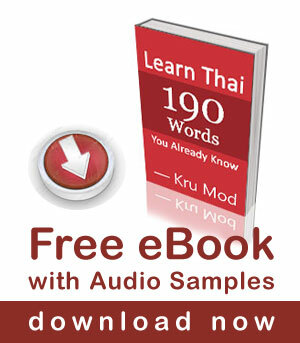 They also have branches in Chiang mai and Bangkok. Everything is packed neatly in a box.